Growing up, Friday evenings were joyous, not only because they throbbed with the promise of 2 whole days of carefree fun in the sun, but also because it was barbecue night with friends and family at the Mombasa Sports Club. We rarely missed a night. There was a veritable smorgasbord of finger food and barbecued meat, including samosas, several types of bhajias, mishkaki, and kebabs but the highlight was the chicken tikka, which is essentially barbecued chicken but to just call it that is so reductive because it is the most flavourful barbecued chicken I have ever had (my Caribbean friends will surely disagree and make a similar claim about their jerk chicken). 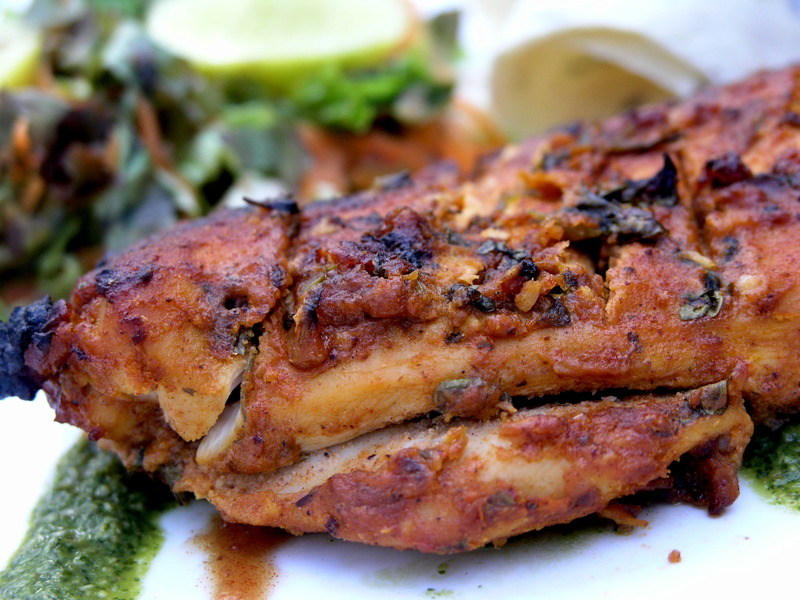 Breast and leg pieces on the bone are marinated in a garlicky, spicy, tangy yogurt based marinade and then cooked on a barbecue till they are soft and tender and infused with that inimitable chargrilled flavour. Chicken tikka is usually accompanied with naans, a shredded raw salad (lettuce, carrots, onions, tomatoes) and an array of chutneys, (tamarind, coconut, chilly, yogurt and coriander). 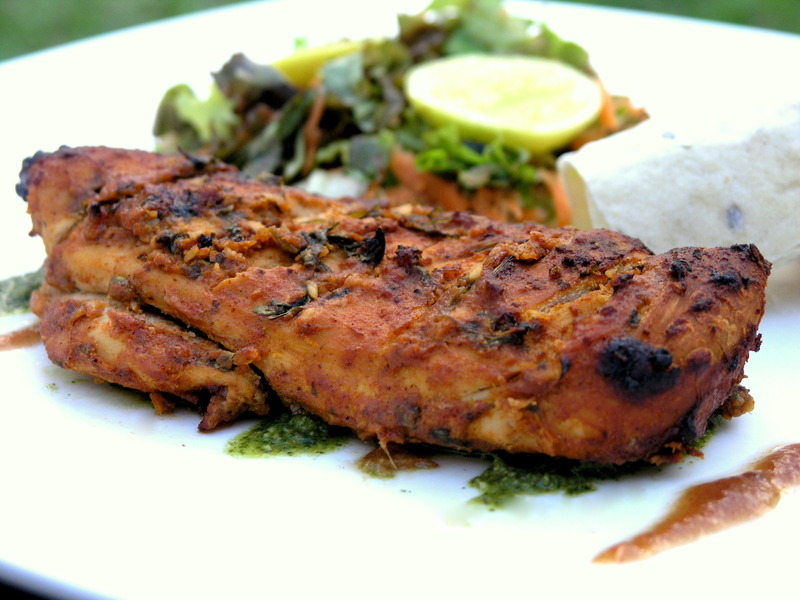 There is no masala, it is just chicken tikka! Indeed, there is no need for a masala. And this is strictly finger food! Forks and knives are not advisable or welcome and could very possibly lead to your tikka flying across the table and hitting a small child in the face – I’ve seen it happen! Chicken tikka is a close relative of tandoori chicken, only the cooking method is different – a barbecue/grill versus a blindingly hot clay oven. We don’t go to the Mombasa Sports Club anymore. Yesterday evening, in honour of the barbecue Fridays of my childhood and youth, I made chicken and vegetable tikka for my dad and myself. Preparation Time: 15-20 mins; Marination time: at least 4 hours but preferably overnight; Cooking Time: 25-30 minutes. Please do not be put off by the long list of ingredients. It’s a doddle to put the marinade together, and once that’s done, all you have to do is let it marinate and then pop it into the oven or on the barbecue and let it cook! This is a wonderful basic marinade which you can use on other cuts of chicken, paneer, vegetables, fish, pork, firm tofu, but do check cooking times and nutrition values as they will vary. I used whole chicken breasts from a small chicken. If the breasts are large, do slice them in half into fillets. Update 23/06/12 Upon making these several times in the last few months, I reduced the amount of warm spices (the cumin and the chilli powder) because they were dominating the other flavours a little too much and I changed the yogurt to Greek yogurt – the thicker the yogurt the better because it coats and stays on the chicken much better, especially useful when barbecuing. If you are using the gram/chickpea flour, make a roux by heating the oil in a frying pan on low-medium heat and adding the gram/chickpea flour. Cook the flour, stirring all the time, until it takes on a reddish brown colour – should only take 1-2 minutes. If you cannot get chickpea flour or don’t have it to hand, leave it out and add the oil directly to the other ingredients. Prepare the other ingredients (except the chicken) as directed above and then mix them all together well, including the roux. 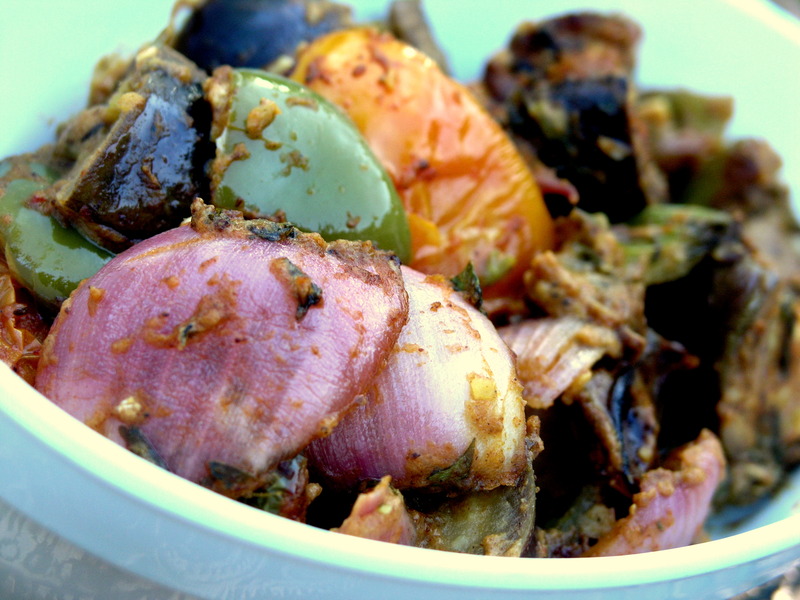 Taste and adjust to your liking – it should be spicy, tangy and garlicky. Do not be alarmed if it tastes very spicy; chicken breasts need all the flavouring they can get and once cooked, it will all make sense! The breasts should be of even thickness. If they’re not, place them between two pieces of cling film and pound them with a mallet or rolling pin until they are even – they should be about 1cm in height. Cut several slits on both sides of the chicken breast to allow the marinade to flavour as much of the chicken as possible. . Place the breasts in the marinade and massage well. Marinate for at least 4 hours or overnight in the refrigerator, in which case, bring to room temperature before cooking. Preheat oven to 200C/180C fan-assisted/Gas Mark 6. Put the chicken breasts in a baking tray lined with foil (keeping aside the remaining marinade) and bake on the middle shelf of the oven for 20 minutes. Open the over door, baste the chicken with some more marinade and turn over. Bake them for another 5-10 minutes. Do be careful not to overcook the chicken as it will dry out. In order to test readiness cut into the chicken, there should be no pink visible and any juices should run clear. Ideally, I would cook this on a barbecue but it wasn’t possible yesterday as it rained all day. Besides, with this oven cooking method you can make it 365 days of the year, rain or shine. When the chicken tikka is ready, switch off the oven and let it rest for 5 minutes before serving with the accompaniments of your choice. There is a lot of flavour in the chicken so you don’t need a lot of extra sugar/fat laden chutneys. A fresh chopped salad and a small naan/pita bread/tortilla wrap with just a little chutney or even a squeeze of lime juice should suffice. If there is any left over, it makes a lovely chicken sandwich the next day! Per serving: Calories 276, Protein 41g, Carbohydrate 12g, Sugars 7g, Fat 7g, Saturates 1g, Fibre 1g. A good source of Vitamin B6, Phosphorus and Selenium, and a very good source of Protein and Niacin. Tender, succulent and tinglingly tasty – all the things a good tikka should be! Oh my lord !!! Chicken Tika Fridays at MSC are some of my best childhood memories. Thanks so much Ronnie. Dad said it had a lot of flavour, do try it out and let me know how it is. Hope lunch isn’t too bad for you today! That looks exactly like msa club tikka! Weldone sis, though I still think you’re nuts to be posting some of your best recipes for free. Be a bit ‘kanjoos’ please! BTW, right now I envy that kid who got hit in the face with a chicken leg! Salivating. LOL! Winnie – you’re hilarious! Try making it for yourself, you don’t have to wish to be hit in the face with it! Thanks so much James, I didn’t think tinglingly would be in the dictionary but it is, as the adverb of tingle! I thought I was making a word up, kumbe it already exists!